On Thursday we went to the Animal Kingdom. Nick & I knew for sure that this would be Addy’s favorite park & we were absolutely right! The Kilimanjaro Safaris ride was at the very top of our list of things to do, so as soon as we got to the park, we headed straight back to the Africa section to ride it. Along the way, we ran into a Wilderness Explorer & she set the kids up with a booklet where they could participate in activities & earn sticker badges throughout the park. At this station, the kids learned about flamingos & earned their first badge. Since there was a Fast Pass Plus kiosk right next to Kilimanjaro Safaris, we went ahead & set up our passes before getting on the ride. We chose to use our Fast Passes for the Finding Nemo show, Expedition Everest & Kilimanjaro Safaris. And even though we had just set up a fast pass for later in the day for Kilimanjaro Safaris, there was no line. So we went ahead & rode it right then because riding it 2x is even better than riding it once! This girl was in animal heaven! And the kids earned a few more of their Wilderness Explorer badges. 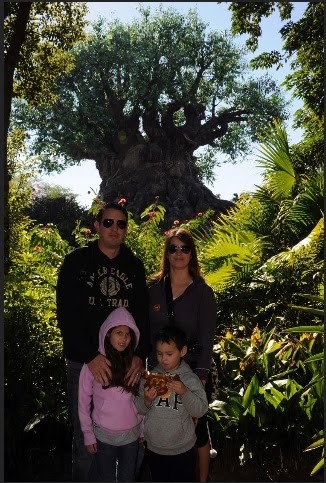 And to take a family picture in front of the Tree of Life. 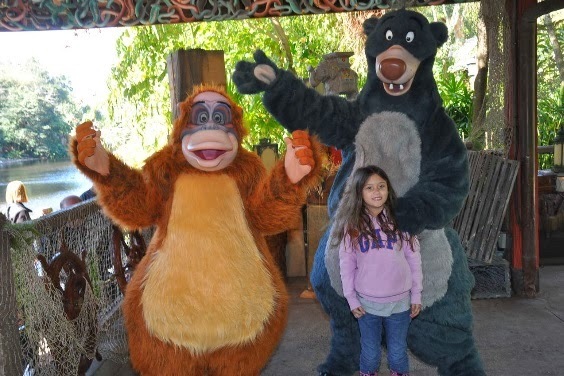 Addy wanted to meet King Louie & Baloo from the Jungle Book. We had a great view of the Tree of Life while waiting in line to meet them. And then she met these 2 silly monkeys! After that, we walked over to the DinoLand USA section where we all rode TriceraTop Spin. Next was The Primeval Whirl. Alex was too short to ride it though so Addy & I rode it while Alex & Nick played some of the Fossil Fun carnival style games. Then we used one of our fast passes to go see the Finding Nemo show. I thought it was fantastic & I think that Nick, Addy & Alex all really enjoyed it too. After that we played a few more carnival games & Addy & Alex both won a prize! Then Addy & I went & rode Expedition Everest. It was pretty scary & when I asked Addy if she wanted to ride it again, she said "No thanks!" Then the kids got their faces painted. And Addy got her's painted like a cheetah. After that, Nick & Addy rode Dinosaur. Then we ate lunch, Nick & Addy watched the It's Tough to be a Bug show & then we all watched the Flights of Wonder bird show. After that we used our last fast pass to ride Kilimanjaro Safaris again. and got to pet some animals. By the time we caught the train back to the main part of the park, it was already 5pm & the park was closed. The park was now closed & the kids had not earned all of their Wilderness Badges. Addy had a really hard time with this. She is NOT ok with leaving things incomplete. She was able to earn a few more badges as we walked towards the front of the park to leave, but not all of them. I even stopped in a store & asked if they sold the badges, but they don't. (They told me that 'Oh, she can bring the book back next time she comes & complete it then!" Yea, that works for some kids, but not for Addy. There is no completing NEXT time... It HAS to be done THIS time!!!) My poor baby cried & cried all the way to the car. By the time we finally got to the car, she had calmed down a little bit. (And stopping to get ice cream at Tasty Treats helped her calm down even more!) I called Disney Guest Services as soon as we got in the car. I explained to them what happened & that they need to have a remedy for this situation. They told me that I could go back to the park the next day & go to Guest Services & they would give me the rest of the badges. But once we got back to our hotel, I hid the booklets & hoped that Addy would forget about them. Which thankfully she did! I really hate that it happened at the Animal Kingdom because besides that, this park is awesome!